Warsaw, 8 March 2018 –JSE listed EPP (Echo Polska Properties) - the retail-focused Polish property play - today released annual results for the year ended December 2017 with distributable earnings of €76.6 million translating into distributions of 10.87 eurocents a share, ahead of previously stated guidance. Consumers know what they want from shopping centres - they demand the presence of certain retailers as well as extended trading hours, according to the Broll Shopper Segmentation Report 2016 Volume 1. Safari Investments, which focuses on township shopping malls, is on course to grow to a R3bn fund in 18-24 months. South Africa’s inland shopping malls could be in for pleasing festive season sales as a result of the country’s struggling economy, according to Managing Director of Atterbury Asset Managers, Lucille Louw. This is because fewer families can afford to take holidays this year. 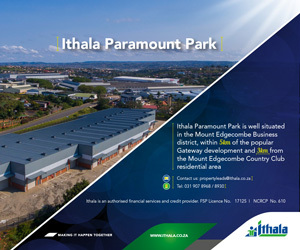 Bridge City, a key link in KwaZulu-Natal’s rapidly developing Northern Growth Corridor, is attracting entrepreneurs and new entrants into the property development space thereby helping grow the regional economy and uplift surrounding communities. Capital & Regional appoints Laura Whyte as its non-executive director to take effect from December 1. Hyprop Investment Limited’s Gauteng-based regional shopping centre, Clearwater Mall, has tripled the generation output of its solar photovoltaic PV plant and now boasts Africa’s largest rooftop Solar PV system. Durban’s Point precinct is been transformed into a property market paradise, with upgraded roads and waterways leading to upmarket apartment blocks.